DFW Building Maintenance maintains high standards for its employees. We have a training program that insures all employees are knowledgeable about the duties they perform for you and your property(s). We provide on-site suprevision and job performance reviews as well as recognition for exceptional service. 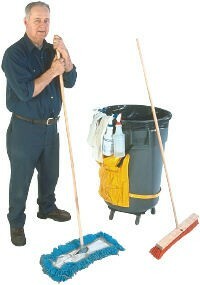 This guarantees you the best cleaning service possible. To respond quickly should an emergency or disaster situation occur, DFW Building Maintenance is fully equipped and prepared to support the recovery of your operation. Each of our staff is fully equipped with complete telecommunications including cell phones with email and office software that is routed to our phones. Each staff member knows his role(s) as well as where our particular building structures are located in proximity to our day-to-day schedules. We will always be available to you promptly and professionally. Our primary responsibility as a daily vendor in your facility is to always be available and keep all team members well-informed in coordinating crisis calls. After we determine as a team the extent and severity of the disaster, we will then notify the proper recovery personnel and keep you informed of our activities and the recovery progress.